You’ve been good all week. Eating well, exercising, right? Even if you haven’t, let’s just say you have. Why? Because it’s Friday and baby you deserve to cut loose! So grab yourself a glass of wine (or whatever your drink of choice is) and let’s make some Macaroni & Cheese Prosciutto Cups! Line a muffin tin with prosciutto. Make the mac n’ cheese. Fill the prosciutto cups with the mac n’ cheese and bake. Make the wafers, simply by baking shredded parmesan. 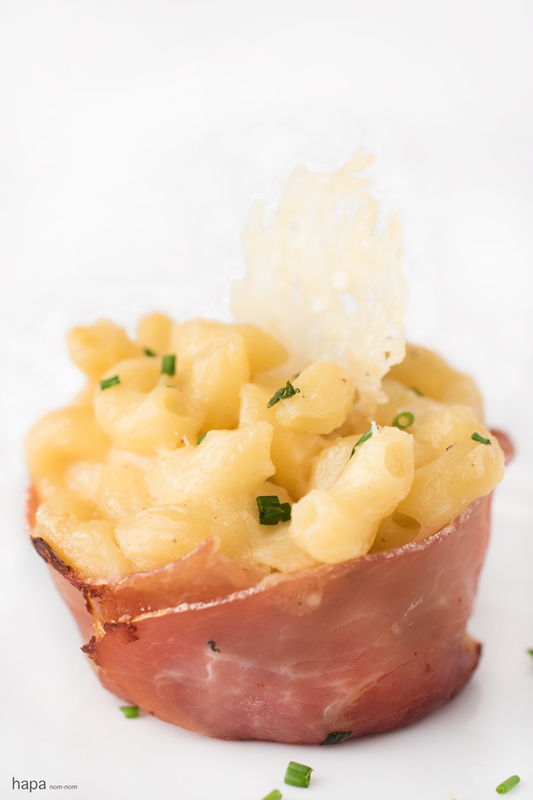 Plate the mac n’ cheese prosciutto cups, sprinkle with chives, and top with a wafer. Ok, so obviously I’ve gone into more detail in the recipe instructions; but you get the idea. Pretty simple, right? 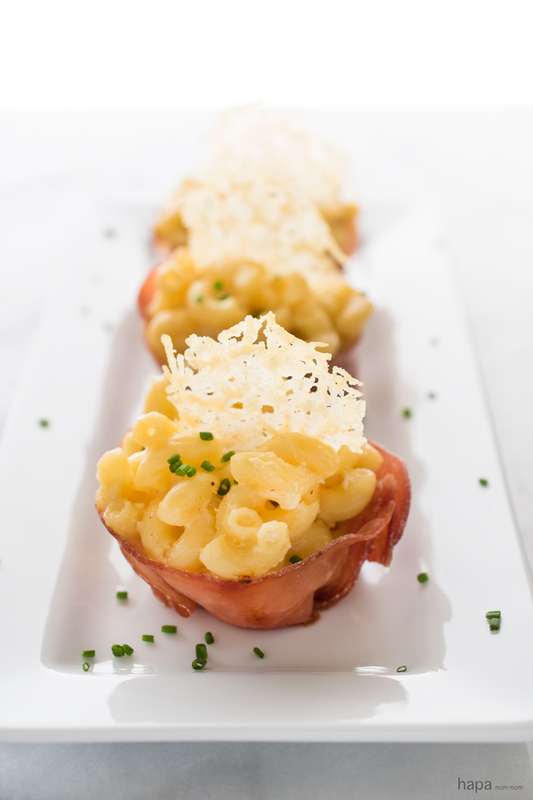 So come on, let’s make some Macaroni and Cheese Prosciutto Cups – you’ve earned it. Creamy Macaroni & Cheese in a crispy Prosciutto Cup and topped with a lacy parmesan wafer - comfort food made elegant, but it couldn't be easier to make! Spray a 12-cup muffin tin with non-stick spray. Line each cup with 1 slice of prosciutto and bake for 5 minutes. Remove from the oven and set aside. Bring a large pot of salted water to a boil (it should be salted like the ocean). Cook according to the package directions. Drain and set aside. In a large sauce pan over medium-low heat, melt the butter. Add the shallot and garlic and sweat for 5 minutes, stirring occasionally. Do not let it brown. Sprinkle with flour and stir to fully incorporate. Slowly add the milk while whisking continuously. Bring to a boil and then reduce to a simmer. Continue to stir constantly for 5 minutes, until it has thickened. Add the cooked macaroni and stir to fully incorporate. Add salt and pepper to taste. Spoon the macaroni and cheese into each prosciutto-lined cup and bake uncovered for 15 minutes. Allow the cups to cool while you prepare the parmesan wafers. Meanwhile, line a sheet pan with parchment paper. Place 1 teaspoon of the extra parmesan cheese in a little mound. Using the back of the spoon, spread the mound out into a small circle, about the size of a silver dollar. Bake for 4-5 minutes, just until they start to turn golden brown and crispy. Remove from the oven and allow to cool before removing. 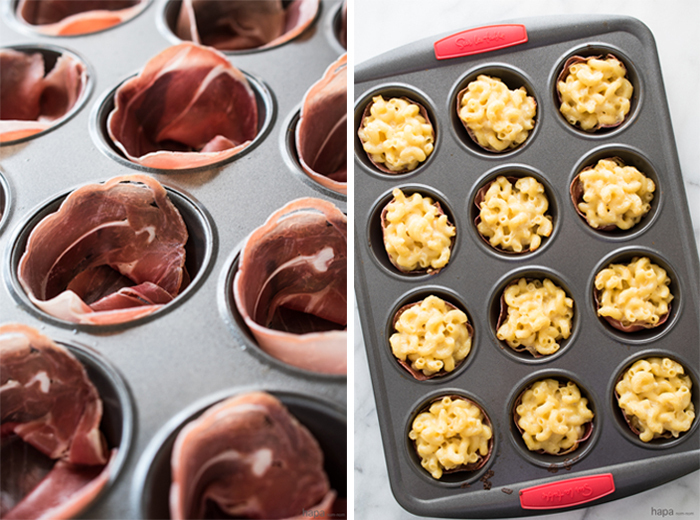 Remove the macaroni and cheese prosciutto cups from the muffin tin and plate. Garnish with chives and top with a parmesan wafer. Serve and enjoy! * The sauce can be made the day before. In that case, wait to cook the macaroni until you're ready to assemble the dish so it doesn't dry out. When you're ready to assemble everything, simply heat the cheese sauce gently in a sauce pan. Then add the cooked macaroni. Oh my gosh so sinfully good!!! Yes! I love this! Mac ‘n cheese is perfect – throw in some prosciutto and I’m in! These are such a great idea! I love prosciutto and I love mac & cheese, how can you go wrong?! Love it! Thanks so much, Senika! Mac n’ Cheese and prosciutto are a match made in foodie heaven. Bite sized means you can have more…. right? Wow! What an amazing idea of making prosciutto cups. And stuffing of mac n cheese looks so gorgeous and sounds so yummy! Yes, yes and yes!! I love this! I bet the combination of prosciutto, mac n cheese, and parmesan in one bite is fantastic! This is ultimate comfort food perfect for the weekend!! Of course I could handle an entire plate of these, as well! But those little crispy wafers need to become a usual at my house. Love them! The crispy little wafers have already become a usual in our house 😉 They’re great to snack on and to serve to guests along with a cheese board! Yeah, I haven’t been that good this week, but it is Friday – time for some prosciutto mac and cheese cups! Love them! Pinned to cry them! I LOVE THAT WE ARE IN SYNC! And no, I haven’t been good at all this week but I still DESERVE these!! You are a legend, I could totally eat a whole platter of these. I LOVE prosciutto and I LOVE Mac N Cheese and putting them in cup form? Genius. Major sharing about to happen! I love these, Kathleen!!!! love the prosciutto “wrappers”!!!! Prosciutto is a magical ingredient, isn’t it? These look so gorgeous and so yummy! I love the whole concept – such a fabulous party idea! And with the holidays coming up, a girl can use all the ideas she can get! I love your parmesan wafer on top too…so pretty!